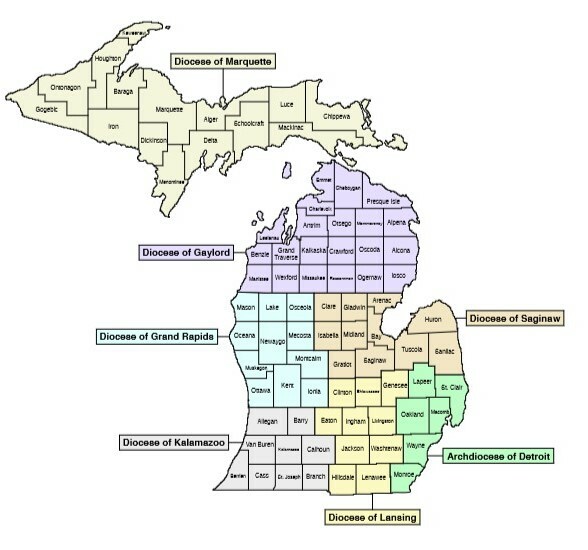 Archives of the Archdiocese of Grand Rapids is the place to contact for Catholic records in the eleven county area in west Michigan. The Archives of the Archdiocese of Grand Rapids, MI, 300 Division Ave, S, Grand Rapids, MI 49503 616 459-4509. The diocese was established in 1883. Currently, it consists of 81 parishes in the Michigan counties of Ionia, Kent, Lake, Mason, Mecosta, Montcalm, Muskegon, Newaygo, Oceana, Osceola and Ottawa. I contacted Fr. Dennis W. Morrow, Archivist of the Diocese of Grand Rapids, and he was very helpful and answered my many questions. The number one thing I would like to iterate is that the Archives doesn't have staff to accommodate on site research. Fr. Morrow stated, "We are happy to answer any reasonable requests from researchers. These are best received by U.S. Mail, or by phone at (616) 459-4509, or at this e-mail address, ssppbulletin@gmail.com." Notice the use of the word "reasonable". The archives is willing to do look ups, but doesn't have the staff to do your research for you." A well written query that includes names, dates and places will make your request more successful. A query that states I would like all the information on the Smith family won't. Fr. Morrow wrote about the condition of the records. He writes, "The sacramental records that are in the possession of the Archives are some of the oldest records from some of our oldest parishes. We do not allow researchers to peruse these records due to our lack of staffing, but also because the records themselves are very fragile. Many of them are difficult to read and interpret, written in Latin and in nearly illegible script. So it is generally far more fruitful for us to receive the requests and then search the records for results." If you have Catholic records research to do while you are in Grand Rapids, you can view pre-1900 sacramental records on microfiche at the Grand Rapids Public Library. Sacramental records include baptisms, confirmation, first Communions, marriages, and deaths. Fr. Morrow states, "The drawback is that the fiche can be difficult to use, and can only show what is in the original register, which is often hard to read. We are happy to assist researchers in making sense of what they find." Other records that the Archives holds include all the student records of St, Joseph's Seminary in Grand Rapids from its opening in 1909 to its closure in 1981. Extensive historical materials on all the parishes and institutions of the Diocese are available, too. Fr. Morrow also shared, "Researchers are often happy to find that we have begun to transcribe, translate, and index some of our oldest sacramental records for the benefit of all. We also have scanned the records from a number of our parishes. This not infrequently makes it possible to look up a family name and provide an immediate "Yes" or "No" as to whether a family name might be found among some of the oldest parish records." The Archives is near St. Andrew's Cathedral and Catholic Central School. The piazza area around the cathedral is a beautiful, peaceful setting. If you get a chance to visit while in Grand Rapids, it is a place to see and within walking distance of the National Genealogical Society's conference center, DeVos Place. Church records can be some of the richest resources a genealogist can find and the Archives at the Archdiocese of Grand Rapids can be a repository you want to use for your Catholic church records in West Michigan.